PCMs are a form of computer random-access memory (RAM) that store data by altering the state of the matter of the "bits", (millions of which make up the device) between liquid, glass and crystal states. PCM technology has the potential to provide inexpensive, high-speed, high-density, high-volume, nonvolatile storage on an unprecedented scale. The basic idea and material were invented by Stanford Ovshinsky, long ago, in1975, but applications have lingered due to lack of clarity about how the material can execute the phase changes on such short time scales and technical problems related to controlling the changes with necessary precision. Now high tech companies like Samsung, IBM and Intel are racing to perfect it. The semi-metallic material under current study is an alloy of germanium, antimony and tellurium in the ratio of 1:2:4. In this work the team probes the microscopic dynamics in the liquid state of this PCM using quasi-elastic neutron scattering (QENS) for clues as to what might make the phase changes so sharp and reproducible. On command, the structure of each microscopic bit of this PCM material can be made to change from glass to crystal or from crystal back to glass (through the liquid intermediate) on the time scale of a thousandth of a millionth of a second just by a controlled heat or light pulse, the former now being preferred. In the amorphous or disordered phase, the material has high electrical resistance, the "off" state; in the crystalline or ordered phase, its resistance is reduced 1000 fold or more to give the "on" state. These elements are arranged in two dimensional layers between activating electrodes, which can be stacked to give a three dimension array with particularly high active site density making it possible for the PCM device to function many times faster than conventional flash memory, while using less power. "The amorphous phases of this kind of material can be regarded as "semi-metallic glasses"," explains Shuai Wei, who at the time was conducting postdoctoral research in SMS Regents' Professor Austen Angell's lab, as a Humboldt Foundation Fellowship recipient. "Contrary to the strategy in the research field of "metallic glasses", where people have made efforts for decades to slow down the crystallization in order to obtain the bulk glass, here we want those semi-metallic glasses to crystallize as fast as possible in the liquid, but to stay as stable as possible when in the glass state. I think now we have a promising new understanding of how this is achieved in the PCMs under study." Over a century ago, Einstein wrote in his Ph.D. thesis that the diffusion of particles undergoing Brownian motion could be understood if the frictional force retarding the motion of a particle was that derived by Stokes for a round ball falling through a jar of honey. The simple equation: D (diffusivity) = kBT/6? ?r where T is the temperature, ? is the viscosity and r is the particle radius, implies that the product D?/T should be constant as T changes, and the surprising thing is that this seems to be true not only for Brownian motion, but also for simple molecular liquids whose molecular motion is known to be anything but that of a ball falling through honey! "We don't have any good explanation of why it works so well, even in the highly viscous supercooled state of molecular liquids until approaching the glass transition temperature, but we do know that there are a few interesting liquids in which it fails badly even above the melting point," observes Angell. "One of them is liquid tellurium, a key element of the PCM materials. Another is water which is famous for its anomalies, and a third is germanium, a second of the three elements of the GST type of PCM. Now we are adding a fourth, the GST liquid itself..!!! thanks to the neutron scattering studies proposed and executed by Shuai Wei and his German colleagues, Zach Evenson (Technical University of Munich, Germany) and Moritz Stolpe (Saarland University, Germany) on samples prepared by Shuai with the help of Pierre Lucas (University of Arizona)." Another feature in common for this small group of liquids is the existence of a maximum in liquid density which is famous for the case of water. A density maximum closely followed, during cooling, by a metal-to semiconductor transition is also seen in the stable liquid state of arsenic telluride, (As2Te3), which is first cousin to the antimony telluride (Sb2Te3 ) component of the PCMs all of which lie on the "Ovshinsky" line connecting antimony telluride (Sb2Te3 ) to germanium telluride (GeTe) in the three component phase diagram. Can it be that the underlying physics of these liquids has a common basis? 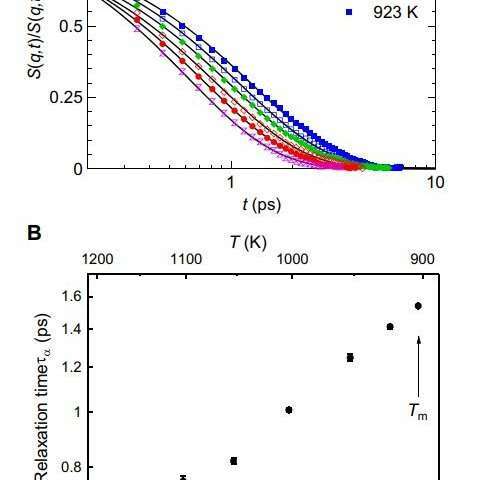 It is the suggestion of Wei and coauthors that when germanium, antimony and tellurium are mixed together in the ratio of 1:2:4, (or others along Ovshinsky's "magic" line) both the density maxima and the associated metal to non-metal transitions are pushed below the melting point and, concomitantly, the transition becomes much sharper than in other chalcogenide mixtures. Then, as in the much-studied case of supercooled water, the fluctuations associated with the response function extrema should give rise to extremely rapid crystallization kinetics. In all cases, the high temperature state (now the metallic state), is the denser. "This would explain a lot," enthuses Angell "Above the transition the liquid is very fluid and crystallization is extremely rapid, while below the transition the liquid stiffens up quickly and retains the amorphous, low-conductivity state down to room temperature. In nanoscopic "bits", it then remains indefinitely stable until instructed by a computer-programmed heat pulse to rise instantly to a temperature where, on a nano-second time scale, it flash crystallizes to the conducting state, the "on" state. Lindsay Greer at Cambridge University has made the same argument couched in terms of a "fragile-to-strong" liquid transition". A second slightly larger heat pulse can take the "bit" instantaneously above its melting point and then, with no further heat input and close contact with a cold substrate, it quenches at a rate sufficient to avoid crystallization and is trapped in the semi-conducting state, the "off" state. "The high resolution of the neutron time of flight-spectrometer from the Technical University of Munich was necessary to see the details of the atomic movements. Neutron scattering at the Heinz Maier-Leibnitz Zentrum in Garching is the ideal method to make these movements visible," states Zach Evenson. The original SDRAM memory back in the 90's running at 100 MHz could access a word of memory in 20 nanoseconds. The latest DDR4 memory can access it in around 10 nanoseconds, even though the command frequency has increased to 1800 MHz. RAM is actually very very slow, and hasn't improved much in the last 20 years. That's a major impediment to computer performance - random access to data is really slow and cache misses carry a terrible penalty. You can stream gigabytes per second, if you already know which data you want, but if you need to do something smart like branching your code, it all goes down the toilet. For the same reason, things like GPUs and the shader algoritms which run on them, which really need fast memory access, are really inefficient in how they use RAM. They have multiple copies of the same data in different parts of memory just so they could pull a copy as soon as possible without waiting for the previously accessed memory cells to recharge. @Eikka, I agree with your assessment that this is not ground-breaking memory technology. There are, however, such technologies that have been proven in the lab; when they will emerge into real technology is difficult to assess when more tricks like this one keep showing up and brain-dead marketing drones keep succeeding in convincing management to put money into tricks and not into truly ground-breaking technology. A board is long and hard and made of wood. Amazing to read "the structure of each microscopic bit of this PCM material can be made to change from glass to crystal or from crystal back to glass (through the liquid intermediate) on the time scale of a thousandth of a millionth of a second just by a controlled heat or light pulse, the former now being preferred. In the amorphous or disordered phase, the material has high electrical resistance, the "off" state; in the crystalline or ordered phase, its resistance is reduced 1000 fold or more to give the "on" state" nice article. Remember germanium circuits? Never happened. Then optical computing. Didn't happen. Quantum computing. Didn't happen. Still, the happy new stories continue about potential radical breakthroughs. @Eikka - there are actually a variety of memory types in use today. The kind you are referencing use cells based on tiny capacitors, and are only capable of holding onto their contents for a few hundred microseconds. That is why they need to be refreshed, or read and rewritten every 100 microseconds or so. But there are other types of memory based on flip flops that are much faster, and capable of holding onto their contents as long as power flows (no refresh needed). The problem is that each cell is a lot larger (it takes more transistors to make them work) and consume a lot more power. The fact that this new material is capable of holding onto its memory contents without needing refresh, and the size of the cells is small because only a single driver transistor is required, combined with the fast read/write access time of the new material, is truly a game changer. PCM is not so much a replacement for DRAM than for Flash. Flash is much slower than DRAM, but is needed for non-volatile data. So huge PCM memories are meant to replace Flash and hard disk drives. Assuming of course that PCM will be better than those, in terms of space, speed, price and consumed electricity.